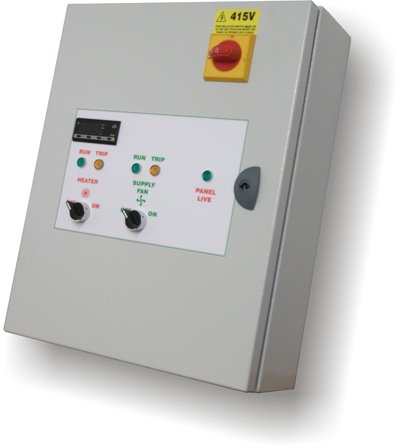 Our 3 step heater control panel is designed to control an electric heater in three single-phase steps, up to 9kW. The control panel also controls a single phase supply fan 2amps as standard (give fan details when ordering if different), with fan run on timer. The control panel comes with a duct sensor. The control panel is designed for wall mounting in a clean, dry environment where the ambient temperature does not exceed 30°C. A space approximately 50mm should be left around the enclosure to allow for heat dissipation. Fix the enclosure to the wall using proprietary fixings. Remove the gland plate then drill and gland for necessary cable entry and exits. Replace the gland plate and wire panel in accordance with the wiring diagram. All wiring must comply with current regulations and be in compliance with the Health and Safety at Work Act. 2 minute Supply Fan run on timer. Have a question about Sarum 3 Step Heater Control Panels? Please fill out the form below and we will get back to you.